It is good to use a claim settlement ratio for term insurance buying. The Insurance Regulator of India (IRDA) announces this ratio annually. This report is valid till June 2016 and the next report will be announced by IRDA. Let’s know more about it. The claim settlement ratio is defined as the ratio of claims paid to nominees by the insurance company and total claims received from consumers. Here is the IRDA latest claim settlement Ratio 2014-15 for Life insurance and Health insurance. As you can see in the image above, the claim settlement ratio for Life Insurance industry is at 97%. However, most of it is due to LIC’s (Life Insurance Corporation) large base with great CSR. LIC of India is on first rank with the 98% claim settlement ratio. It has 755,901 number of death claims received and 742, 243 number of death claims paid. On the second number, there is Bajaj Allianz with the claim settlement ratio of 92%. On third rank, there is Reliance Life with claim settlement ratio of 84%. There are many more life insurance companies in the image with their claim settlement ratio 2014-15. 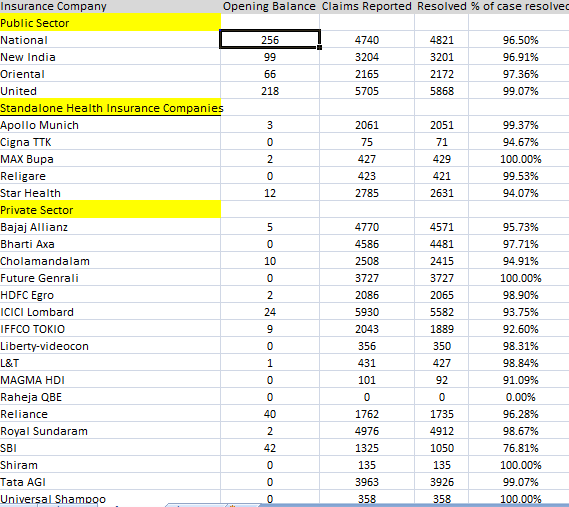 Here is the Health Insurance Companies IRDA Latest claim settlement ratio 2014-15. This is the Health Insurance Claim Settlement Ratio of 2014-15. Well, look at the fixed complaints and the status of pending data as well. As you can see the claim settlement ration in the image, your insurance companies are fast when it comes to customer satisfaction. With the help of the above image, you can decide which company to choose among all of them. Before choosing any Life Insurance or Health Insurance companies, identify your needs and then go for most suitable plan.Remember one thing that Individual plans always cost more than Family Floater plans. Use the IRDA Latest Claim Settlement Ratio 2014-15 when you are going to buy a term insurance plan. Refer both the images to choose the insurance plan whether it is Life Insurance or Health Insurance plan.Moreover, in case of any questions or queries regarding this claim settlement ratio, please leave comment below!